How can you get the most out of your compost, increase decomposition, and create healthy organic matter? By turning it, of course! It’s important to aerate your compost pile once a month or so. When your compost becomes too compacted, air pockets are reduced. Air is very important to the decomposition process. As organic matter decomposes, the pile will shrink down and compress. When you turn the compost, aerated compost creates pockets where oxygen and moisture can get inside and supply the microbes. Compaction can also result in water-logging and overheating, creating a very slow and inefficient compost. Monitor the moisture levels in your compost. Ideally, compost should have the consistency of a wrung-out sponge. To effectively turn your compost, push the inner part of the compost pile to the outer walls, and push the outer compost into the centre. This will ensure that the heat gets distributed more evenly. You can do this with a tumbler, or manually with a garden fork. There are plenty of tools out there that can make the job easier. It is especially important to aerate your compost whilst there are grass clippings in there. During spring and summer, grass clippings can take up a compost bin’s space substantially if you’re not careful. You can choose to stay diligent with the turning to ensure it breaks down quickly, or simply add the clippings slowly to reduce buildup. 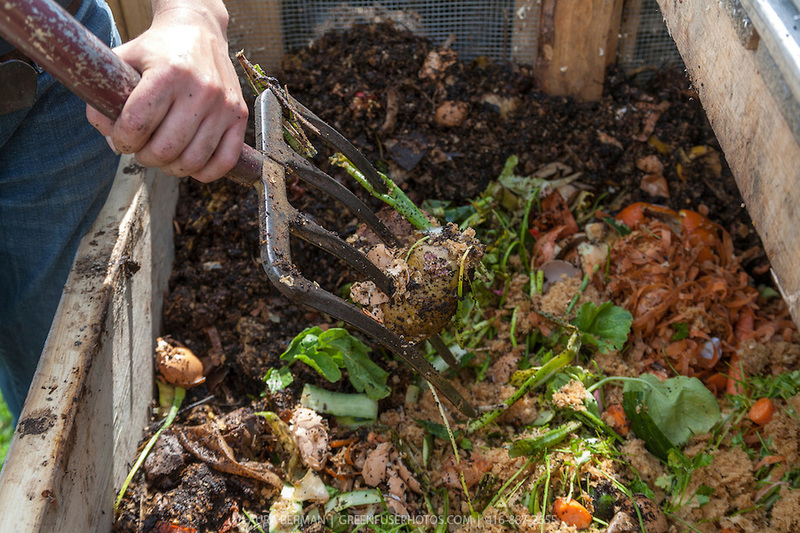 For best results in your compost bin, try to have a mixture of 50% garden waste such as leaves and grass clippings (Carbon) and 50% kitchen food scraps (Nitrogen). You can use any organic matter such as vegetable and fruit scraps, plant matter (clippings, leaves, flowers, and small prunings), general garden waste, and some newspaper and cardboard. You’ll find it’s just a quick job you can do occasionally, for some great results! We recommend Fiskars for the best tools.